Adolfo Hernandez Alvarado was born in Northern Mexico's Ciudad Juarez, and both the city and country remain major influences in his work. Both the rich, colorful culture of Mexico and the dreadful violence that has consumed his hometown have had a strong impact on his work. Adolfo's introduction to art began at a young age; while running errands with his mom he'd study the array of murals that cropped up in neighborhoods around the city. Later, his family moved to El Paso, and what had been a hobby turned into a teenage profession, painting commission pieces with his friends in the Trez Toltekatl crew. His pursuit of art led him to the Savannah College of Art and Design in 2002, where he studied Motion Graphics and continued to paint regularly. Adolfo became involved in Savannah's bustling arts community, showing his work often, including events like DeSoto Strut (a semi-annual gallery hop in the city's Starland District), Taste (a day-long celebration of Savannah's art and music communities), and the Savannah Urban Arts Festival (a multi-day annual event held every spring). 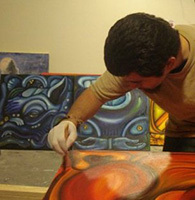 His unique use of form and color draws inspiration from comic books, graffiti, religious iconography, and the intricate designs of the Mayan and Aztec. His subject matter spans an equally broad spectrum; slick abstractions or gritty explorations of the violence endemic to the US-Mexican border region.